"I refuse to subscribe to the local newspaper" said an unnamed Monroe school board member, when asked about a subscription to the Middletown Journal, a Cox newspaper. As a matter of fact, SMBs like Main Street Monroe are becoming the only source of local news for smaller communities like Monroe, Ohio. Main Street Monroe provides local news from the city and school district as well as information from most local organizations. 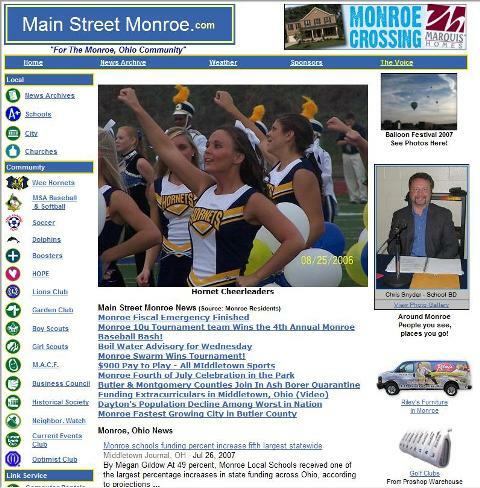 The website also features a wildly popular forum aptly named The Voice of Main Street Monroe. Forum moderators include a city of Monroe councilman, a school board member and several residents. You miss a day, you miss a lot when heated issues get debated here. Accidents are reported within minutes of the occurrence as well as local gossip on the local preacher, Lawrence Bishop and others. Local websites like Main Street Monroe connect with the people, because the people of the community become the reporters and the consumers of the news.